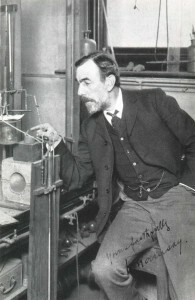 William Ramsay (1852-1916) at work. Ramsay discovered the noble gases. July 23 marks the passing of Sir William Ramsay. Ramsay was a Scottish chemist who was responsible for discovering the elements that make up most of the right hand edge of the periodic table — the noble gases. Ramsay collaborated with Lord Rayleigh who had noticed a difference in density between nitrogen obtained from the air and nitrogen obtained through chemical reactions. Ramsay designed a method to remove both oxygen and nitrogen from a volume of air. Once he accomplished this, he found there was still gas remaining. The leftover gas did not react with any other chemical Ramsay exposed it to. He named his new gas argon after the Greek word meaning ‘lazy’ or ‘unreactive’. Ramsay would continue to work with air to isolate other inert gases. He discovered neon, krypton and xenon. He also discovered air contained helium, which had never been found on Earth, but only seen in the spectra of the Sun and other stars. For these discoveries, Ramsay would receive the 1904 Nobel Prize in Chemistry. Lord Rayleigh received his Nobel Prize in the same year for the discovery of argon. Ramsay would discover the last noble gas, radon six years later.